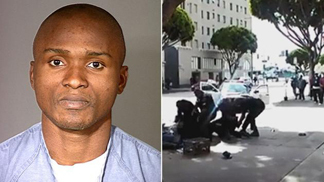 The man fatally shot by Los Angeles police on Skid Row was a Cameroon national and convicted robber who was supposed to be deported, but was released from custody when Cameroon officials failed to cooperate with the deportation effort, federal authorities said. According to U.S. Immigration and Customs Enforcement, a deportation order for the still-unidentified man was issued in April 2013 “while he was incarcerated and serving a sentence in federal prison for armed robbery and firearms convictions.” The man was placed in custody of ICE in June 2013, and the agency tried to deport him, according to the agency. “Subsequently, ICE contacted consular representatives for Cameroon, but Cameroonian authorities repeatedly failed to respond to requests for a travel document,” according to ICE. “Given that ICE was unable to obtain the necessary documentation to carry out the removal, the individual was released from ICE custody under an order of supervision in November 2013 based upon the Supreme Court’s ruling in Zadvydas vs Davis. Since the man’s release, he had regularly reported to ICE's Enforce­ment and Removal Operations office as required by his order of supervision, according to ICE. “His next scheduled date to report was March 5,” according to the agency. The man was also under the supervision of the U.S. Probation and Trial Services System, authorities said. According to the Los Angeles Times, authorities had initially used fingerprints to identify the man as Charley Saturmin Robinet, the name he was using when he was convicted of a 2000 bank robbery in Thousand Oaks. But French officials came forward late Tuesday and said Robinet is a law- abiding citizen who is “alive and well in France,” The Times reported. The man killed during Sunday’s altercation with LAPD officers, French officials said, had stolen Robinet’s identity and used it to acquire a French passport to come to the United States in the late 1990s.